Lens Description: The Sunex 5.6mm f/5.6 SuperFisheye Lens is a super-wide fisheye lens that covers 185°, with enough overlap to create a full spherical image from just two shots. 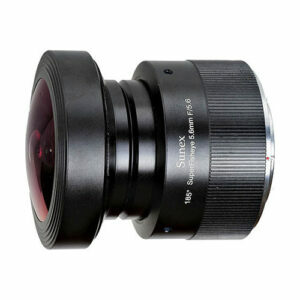 This lens was designed specifically for digital SLR cameras using APS-C format imagers. With an image circle size of 14.5mm, the SuperFisheye forms a complete circular image within the camera\'s imager area.rnrnThe fixed focus and fixed aperture design of this lens provides optimized image quality for both indoor and outdoor photography. The fixed aperture also simplifies the operation of the lens, and eliminates potential errors.rnrnIt is especially well suited for virtual reality and software-assisted panorama stitching. It provides exaggerated perspectives and unusual distortion effects. Sunex also provides a link to a free download of the Dewarper Plug-In software for Photoshop (PC only). Dewarper is a software plug-in for correcting or optimizing distortion taken with popular fisheye lenses, including Sunex SuperFisheye lenses. This program is based on a proprietary algorithm developed by Sunex based on expertise in real-world lens design and manufacturing.